Hi, I am moving out of my parents place in August with my current dog (Springer Spaniel) my cat and a new Aussie pup who I will be getting in June. I plan on training her for service tasks if she turns out to be able to be a service dog otherwise she will be strictly a pet. I have never owned a herding dog before and am looking forward to training and loving my new girl. I'm moving from Minnesota to Florida. Does anyone have any tips for the drive down? Also any information you, as experienced owners, can give would be appreciated. I looked long and hard for a breed that would fit my lifestyle and decided on an Australian Shepherd after weeks of homework. What tasks can I give her? What do your Aussies know? 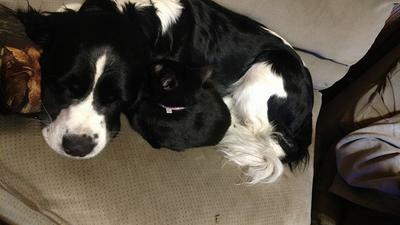 I posted a pic of my Springer and my cat. Sorry he's not an Aussie but I thought it was so sweet and I would love for him to have a sister so I'm looking for all the advice I can get.